Design Your Own Cruise to suit you! We can stop for a swim, you can throw a fishing line in or have a picnic on the riverbank! 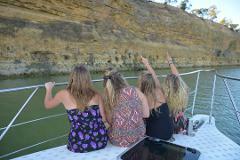 We also have a BBQ on board so you can enjoy lunch while enjoying the spectacular views of the Murray River.